Released in 1986 by Tikkurila. The distinction of being the first television or movie license game from Finland isn't Uuno Turhapuro Muuttaa Maalle, although it was made and released the same year. 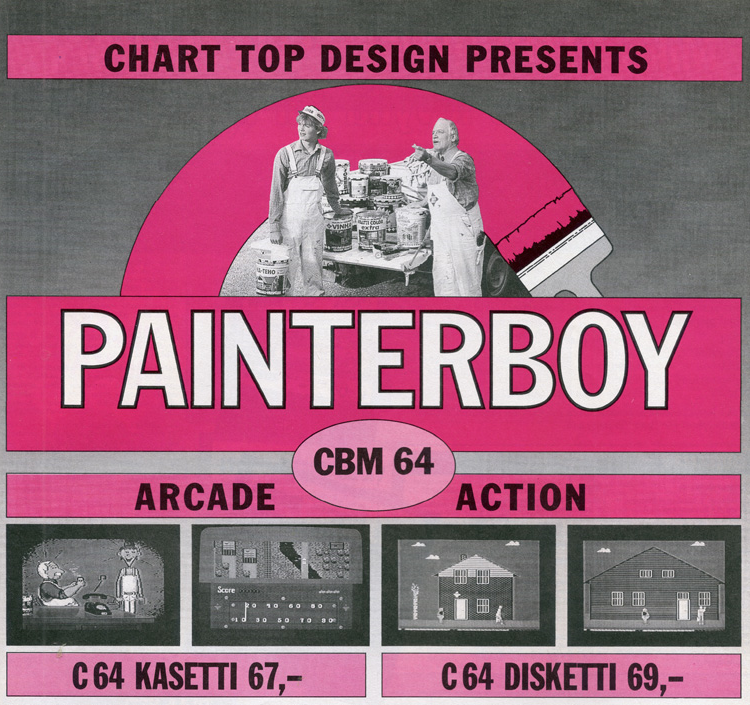 Painterboy was released a short time prior to that, and was based on the television and radio adverts from a Finnish paint company called Tikkurila, but it wasn't a particularly commercial release, so its cult status in Finland was almost entirely achieved by - what else - heavy piracy. I don't ever remember seeing this game being mentioned in any of the Tikkurila commercials at the time, but I was 5 years old at the time of the game's release, and hardly able to pay much attention to anything properly, particularly anything C64-related, since we only had a ZX Spectrum at the time. A recent interview with Teijo Pellinen, the game's programmer, tells us that a few hundred copies of the game were originally given as freebies to Tikkurila customers and co-operatives at some of their events, and a hundred copies or so were then sold to regular customers, mostly through mail order. 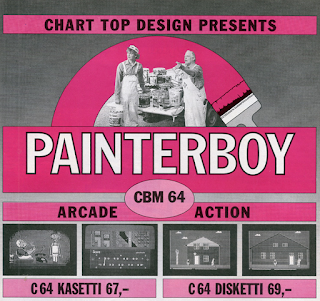 Painterboy did have some advertising space in computing magazines, and there were at least two reviews written for it. You could try to read Teijo's interview from V2.fi, and view the Finnish reviews of the game at Dome.fi, but if you don't understand Finnish, you're going to have to use some kind of a translator, because I'm not going to do it without a permission. Although named similarly to the famous Atari game Paperboy, Painterboy holds little else in common with its distant cousin. In the commercials, we would follow the painting master Kirjavainen trying to teach his apprenticing son about painting things, and the son would often get harrassed by a dog or his attention diverted by a pretty girl or whatever. So, naturally, the game's protagonist is the apprenticing son of the painting master Kirjavainen, whose job it is to learn how to pick the correct sort of paint for different kinds of surfaces you must then paint later in the game, while avoiding girls and dogs. I shall get to the details later on, but in short, the game is segmented in three (or four) parts: picking the paint at your local Tikkurila paint shop, driving to the building you must paint, finish the paint job for the building, and then drive back to the paint shop. In other words, it's simultaneously a puzzle game, an over-head driving game and a platformer of sorts. As I said earlier, the game has something of a cult status, particularly here in Finland, and to me, it has always been preferable to the slightly later released Uuno Turhapuro game. In Printti magazine, the game had an overall four stars out of five, which might have been coloured with some national pride in having an acceptable game product, but currently, 15 Lemon64 users have voted it with a surprisingly nice 7.7, which I think is closer to the truth. You start your day by arriving at your local Tikkurila paint shop, where your first job is to take a look at the current list of jobs. The game starts with an order to finish the paint job at the nearby railway station (rautatieasema), for which you then need to choose the correct paint for. The game acts as an advertisement for the five most commonly used Tikkurila paint types in Finland at the time: 1. Pikateho, 2. Yki, 3. Vinha, 4. Valtticolor Extra and 5. Tehoöljymaali. If you choose the wrong paint for this job, the master reproaches you, but if you choose the correct one, you move on to the driving section. At this point, I could attempt to explain the uses for these paints, at least as far as they can be traced from their modern equivalents. The first one, Pikateho (now spelled "Pika-teho"), is a dark, long-lasting oil-based acrylic paint for painting wood surfaces outdoors. Second, Yki is used for painting the socles. Vinha is a water-soluble paint designed to provide a water resistant surface for wood material. Valtticolor Extra must have been some sort of a colourised stainer (or whatever they call it) that gets sucked into the wood material, the purpose of which is to shelter the wood from weather strains, by slowing down the effects of moisture and sunlight. Finally, Tehoöljymaali (nowadays only called "Teho") is, as its name says, a powerful and traditional oil-based paint, that makes the wood surfaces shine at first, but one of its features is to make the painted material look gracefully aged. Phew, that was a lot of information to dig up - let's see if it served any purpose. Now, the driving sequence is viewed directly above your white pick-up truck, and for the first time in this game, you get to use a joystick. Up and down adjust your velocity, and while you can see the rather nostalgically stylised speed-o-meter at the bottom of the screen, you might as well concentrate on the actual movement in the action screen. Although your truck moves forward rather smoothly, it turns in 45-degree angles, so you need to keep that in mind, when nudging the joystick left or right as many times as you ever need to. If you're quick enough with the joystick, you should be able to perform a U-turn on a regular bit of driveway. Since you probably have no idea where to go at first, there is a compass that tells you the general direction in which your current destination is at. For instance, when you leave the paint shop for the first time towards the railway station, the compass has two white bits pointing roughly southwest. The same wooden panel also has the current score, the game time and your lives left shown. When you get close enough to the job location, you will notice a flashing Tikkurila sign on the spot, which is where you need to park your truck. Don't worry, though - you don't need to actually park it, just hit the flashing sign and you're there. Another thing you shouldn't care too much about: you can often drive through grassy bits and such - it's not quite as pixel-perfect as it's made to look like. Once you get to the job location, the building most likely has a red paintwork with some blue at the bottom, or elsewhere, and the blue parts are what you need to fix. You control the young, slim and tall apprentice who obeys your joystick controls very diligently. The paintbrush is in his right hand, so you need to align yourself in such a way as to be slightly to the left of the spot you're supposed to paint. Also, you have to do a lot of bowing down to reach the lower spots. Thankfully, this is no painting simulation, so you don't need to dip the brush in a paint can after every two seconds, but what you do need to focus on, is being careful not to paint the old man, otherwise he gets mad and the job is cancelled then and there. Also, you need to avoid direct contact with any roaming dogs, flying birds and flirting young maidens - two hits, and you're done. This section has the only really woeful problems in the game, as the avoidable sprites are too random in their appearances and behaviour, it's sometimes impossible to finish your job. The slightly wonky ladder behaviour of your fellow doesn't help either. Although Painterboy's graphics cannot be called particularly impressive, they do have plenty of character, and I especially like the way the commercials' humour has been conveyed here. The grand old master painter Kirjavainen has been portrayed more portly and stiff than he is in the commercials, while the young apprentice has a bit of a goofball appearance to him: tall and impossibly slim, his head swinging back and forth as he walks, and of course, with that paintbrush always occupying his right hand, making it often look like something completely different... I shall leave it to your imaginations. Loading screen (left) and title screen (right). But I'm getting ahead of myself now. I have to admit that I'm not one of the few lucky ones who own this game legitimately, so for the time being, I can only form an educated guess, that the first picture here is the loading screen of the game, and the second is the real title screen. Contrary to the well-established form of scrolling the game's credits in the title screen, Painterboy offers none, so Painterboy's developers' names were unknown to me until I found them from GameBase64, and later confirmed by the interview I linked earlier. In any case, the assumed loading screen features our two heroes inside a Looney Tunes-like circle, and judging by Kirjavainen's posture, it's him saying the Tikkurila slogan written below: "ja homma hoituu!" - meaning more or less "..and things get done!" For the title screen, the graphician went with a more cartoony style. The picture is very fitting for the game, actually: the office phone rings while the master is having his coffee break, and the apprentice gets all excited about getting a new mission. In the immortal words of Mickey Mouse, "oh, boy!" Painterboy features something quite unusual for the time, which might not have been even thought of as such at the time: cutscenes. The game even begins with one - the white pick-up truck driving across the front of the Tikkurila office. Naturally, when you leave the scene, the truck backs up the same way. The only other piece of animation that can be counted as a cutscene of sorts is, when you fail miserably at your job and you are automatically sent off back to the truck - the walking animation for you is often seen, of course, but when it gets shown without your input, perhaps it can be called as a cutscene, I don't know. But oh, that truck. It looks so cheap, yet so perfect - particularly when combined with the sounds, of which I shall be talking of later on. Big pixels, black and white, no animation apart from the sprite moving from one side to the other. My kind of cheapness. in action. The right half features the paint choosing screen. The first interactive screen in the game is the job list, in which you only need to press RETURN to proceed. Here, the only thing even remotely graphical is the two painters standing back-to-back, although you could well argue that text with some colouring effect could also be considered graphical. But that's pushing it. Then come the five paint cans, which look incredibly close to what they looked like circa 1986. If you look carefully enough, you could tell by the pictures in the cans, what sorts of buildings were the paints meant to be used for. My favourite part in the game is driving around the city, because the map is surprisingly vast, and I don't think I have ever managed to visit all the possible targets in the game, so it's always fun to explore. While the action screen isn't very big, it offers a field of vision just big enough to keep you on your toes, but also your gas pedal under better control. This isn't Grand Theft Auto, though - you're not supposed to crash into things and get rewards for it, so you have to follow the grey area for the most part. There are some small green short cuts you can use, but for the most part, stick to the roads. Happily, the map is easy to learn due to the many landmarks and job spots you will undoubtedly get to visit and learn their locations quickly. It says a lot on the quality of the graphician's work, when you are able to navigate by landmarks in a game with fairly large pixels and a limited amount of colours in use. Screenshots from the driving bits, including a train, a target and a crash. The black border in the rightmost picture indicates Game Over. But the driving sequence is not only about the map and the locations - the bottom half of the screen has a speed-o-meter, which was apparently modeled after some old Lada, as well as a running clock, the current score and number of lives. All of this was made using hi-res monochrome graphics, and for gaining the wooden look, this was an interesting choice. Due to the use of brown, it's also something that would not have been able to do on a Spectrum. The low-budget look of the HUD, as well as the relatively peaceful roads in a simulation of a regular Finnish countryside town is something that creates an atmosphere I couldn't imagine anyone from outside of Finland producing successfully in a computer game, and perhaps not even understand it properly. I hope I'm wrong there. Once you get to do some painting, the lack of hurries and worries is fixed by introducing dangerous natural elements, such as birds, dogs and women. Your old master isn't of much help, either - he just walks around like he owns the whole town, and if you accidentally paint him while you're trying to avoid hitting his random movements, you're screwed. Anyway, these dangerous elements come in two styles: the birds and the dogs are single-coloured sprites that have higher amount of animation frames. The human characters have less animation frames, but are bigger and more colourful. Only the apprentice does something more with his body than just uses his feet. Four different painting locations with different situations, featuring the apprentice, the girl, the bird, the dog, the master himself, and the pick-up truck backing up after having failed a job. The painting locations themselves can look pretty idyllic, though. There is a Finnish cliché about the dream of having a red house and a potato field, and part of this cliché has certainly been utilised often in this game. But naturally, there is a reason for this strange fixation about painting your house red - it's because the red dirt-based paint pigment is cheap, so the dream house can be more easily finished with a cheaper paint. I don't like red houses, because there's too damn many of them here. But no matter - in the game, they are acceptable, because they look different and pixelated enough. The other part of the idyll is, of course, having the building in the middle of a forest or a clearing with a few surrounding birch trees, hopefully near a lake or a river. Well, they couldn't get the watery bits into the painting screens, but at least the birch trees are well represented. The only building that isn't red, is the apartment block (kerrostalo), which is yellow... but you still have to paint the blue concrete bits as red. If there's one thing I would have wished for in this game was more colours for the buildings, but I guess they did all they could to actually make the game as playable as they could, with as many decorations as necessary. Usually, I put great deal of importance on the music and sounds being connected to the source material, when a game is made under license from some company, and is connected to a movie or a TV show or whatever. Since Painterboy is based on something as fleeting as a series of Finnish commercials from the earlier part of 1980's, I have only now given any notice to the music in the game, and how does it compare to the music in the commercials. Not that it really matters in the end, because if the music has been well executed and suits the purpose, why shouldn't it be acceptable? In the commercials, our over-all'd twosome's adventures would mostly be accompanied by some banjo-picking country music. The music in the game doesn't exactly sound like country music, but the main melodic instrument has been attempted to make sound like a banjo, or some other plucked string instrument. Also, since the music plays only when you are driving around in your truck, we can have no idea, whether this sort of music would be conceptually correct, since the commercials never let us see our two heroes driving around and listening to music. Perhaps I'm overanalysing this a bit, so nevermind. The music is well enough executed, and it's catchy, and hardly ever plays so long on a continuous loop that you get really tired of it before it's time to go painting. Due to the music being played during the driving sections, you don't really think about missing on sound effects all that much. But still, there are only two sound effects in the whole game, both of which are speech samples, spoken by the programmer himself. Since the samples are in low quality, you can hardly tell, who is the person saying "Poika! ", as master Kirjavainen has a habit of saying. The other speech sample is actually made for the truck, as it passes any building - the "möm-möm" sample simulates the low engine noise of the truck in a similar manner that a child would make noises with his/her mouth when playing with cars. And that's all there is to it. The music is catchy and fitting enough, but technically, not very impressive. The speech samples being the only sound effects in the game is a fun little obscure thing about Painterboy, but while they're funny enough for a Finnish gamer with some connection to the history of the game, they could easily leave the rest of the world wanting for something a bit different, and certainly something more. Painterboy recently got some press coverage due to a group called Kasettilamerit, who got a hold of the original tapes and disks, and digitised them at last year's Assembly party in Helsinki. So far, nothing has been seen of the digitised images, which is a pity, but the original material will be put on display in the Finnish Museum of Games in Vapriikki, Tampere, which will be opened in 2017. Hopefully, the digitised material will find their way online before long after the opening. That's it for this month's Finnish Game Review - there will be a new one every month, at least until June, so let's hope it'll be of some use to you non-Finnish folks out there! Thanks for reading, see you later! I still remember the paint selections from my childhood. The programmer of the game and a representative of Tikkurila were at the event where Kasettilamerit digitized the game, and they tried to play the game, but funnily neither of them knew any of the correct paint selections.